On these pages you will find details of ships that were built at Llanon - Llansantffraed, and information about shipwrecks, mariners, and deeds of heroism performed by men from this parish. Taken in the winter around 1910. There are two ships pulled up on the beach to over-winter. Before the roads were improved throughout Wales goods were brought into the coastal villages by sea. The Joanna was the last of many small vessels trading into Llanon, her arrival was greatly looked forward to. The school children were often kept at home on her arrival, and took meals to their parents who helped with the unloading. This is an example of one such occasion taken from the Llanon school diary in August 1897. When a ship is unloading on the beach the parents are in the habit of keeping one of their children at home to take “tea and dinners” to their families at work. On 22nd May 1840 Trudging past the church workmen, went 200 mainly hinterland emigrants bound for America, and initially set for Liverpool on the steamer President(130 h.p) waiting off shore. APRIL1842 the Sloop "Pilot" sailed from Aberystwyth with around 50 emigrants from this area for Liverpool, and then to America. 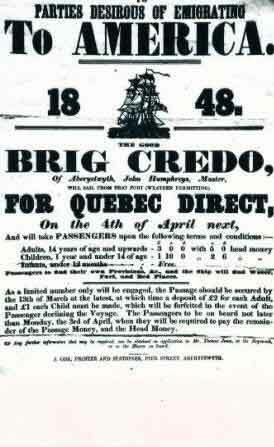 The same spring around 200 people left for Quebec aboard the Brigs "Credo"and Rheidol. These were pretty basic but cheap. The ships would carry timber on their return journeys to Aberystwyth. Fishing Industry in Cardigan Bay 1879-1888. 1874 The Herring season was very bad, the average catch being 50 Herrings per boat. The "Sarah" [25 tons register] arrived at Aberaeron on the 24th of May 1879, she sailed in with a good haul of soles, trills turbots, gurnets, and an enormous angel fish. James Pugh of Aberystwyth worked her for a time; he was paid £2 a month and trawled the grounds from Llangranog to Llanon. On one occasion three Aberaeron men caught £15 worth of fish, of which three hundredweight was sent to Aberystwyth for transport to Liverpool. 1881 there were seven boats engaged in the herring fishery. Each took excellent hauls. In the fist week of October 1882 Capt. Evans of the "Briton" brought in 1,600 herrings and they sold for a penny each. 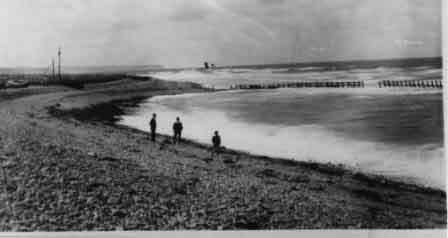 Although no longer existing in Britain a fishing Industry based on large coastal fish traps has been of major importance for centuries if not millennia. They enabled large catches of fish to be taken on a regular basis without boats, creating a reliable food source near which coastal dwellings could be established. Studies of the inter-tidal zones of N Wales revealed many examples of fish traps now classified into eight types. Fish traps are found on many local beaches. Llansantffraed has the remains of many. The traps were still in use in the neighbouring village of Aberarth as the following extract from the Cambrian News 1888 shows. A certain amount of damage was done to the fishing industry by the fish traps [goredi] on the shore at Llandewi Aberarth. One of the goredi was literally crammed with herrings one morning in October 1888 and three donkey carts full were removed. Capt Davies brought in a cargo of Limestone on the "Eliza and Mary". Mary Jenkins one of a number of women labourers employed in the 1860’s and 70’s received 4/8½ for weighing the Limestones; she must have been a very strong woman. NAVIGATION WAS TAUGHT IN LLANON at small schools of navigation held in cottages and houses. It was also taught in the local schools. Both boys and girls learnt navigation as women went to sea sometimes with their husbands. In times of sickness or other emergency they could bring the ship home. LLANON BOARD SCHOOL - Inspectors Report. From the Cambrian News 1917. Captain D.J. Jenkins D.S.C. Lloyds medallist of Brooklands Llanon is home for the weekend, after many bitter experiences over the past twenty months in the submarine zone. Though several attacks were made on his vessel, and on one occasion was under heavy shellfire, he had each time managed to escape. Until July 6th 1917 when his boat was torpedoed and sunk. Even then all hands escaped unhurt. Great credit is due to him and his officers for the able way they controlled their men. On the 27th June 1917 when crossing the Atlantic he encountered an enemy submarine at dawn, and after evading it sighted a large transport, which appeared to be steering in the direction the submarine had been seen to submerge. Captain Jenkins altered his course to warn her of her danger, but on approach found the vessel had already been torpedoed and was in a sinking condition, with all her boats floating around her half full of water. Steps were taken immediately to save the men, and after two hours of strenuous work Captain Jenkins succeeded in saving 250 men and officers. He then cruised around at full speed in search of the 11 men reported missing, though he was convinced there were at least three submarines still in the vicinity. He then proceeded at the utmost speed across the Atlantic with all the rescued troops on board. After having called at St Johns New Foundland to replenish stores, and provide comforts for the troops, all were in due time safely landed at Quebec. At both places Captain Jenkins and his officers were received with great enthusiasm. For his many acts of bravery he was awarded the D.S.C. last November and in addition on his arrival at Cardiff his owners (Messrs Turnbull Bros.) had the honour of presenting him with the Lloyds Silver Medal, as well as Lloyds certificate. Some extracts from the log books of some of these ships have survived and are to to be found in the National Library of Wales, some of the crew lists are also available there. These will each give a complete record of a 6 month period, crew, sailings etc .